Rehearsals and plans for the Really Big Sing in Newmarket are well under way BUT you shouldn’t feel that you have missed the opportunity to be part of it. Just turn up on a Tuesday evening, 7pm at Palace House and you’ll see where we are with our plans! 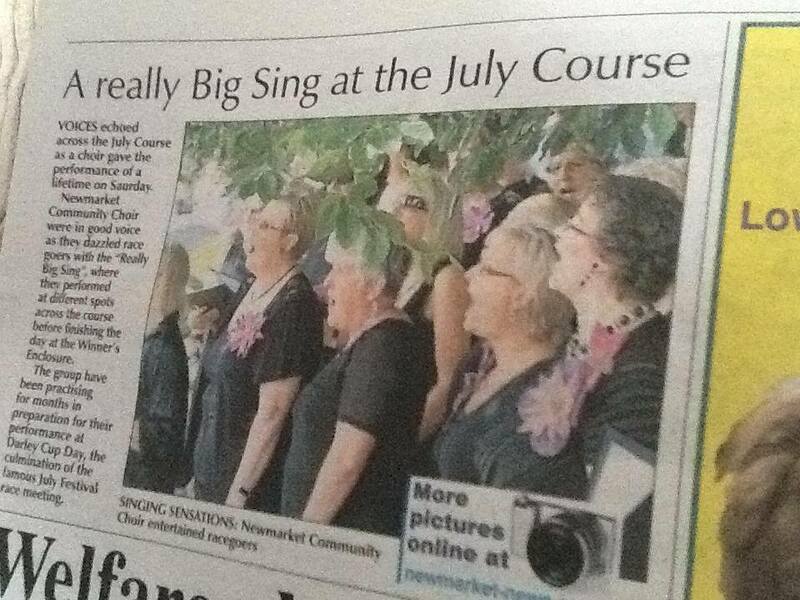 The community choir is at the heart of one of the biggest events that Newmarket will have ever seen. The Really Big Sing will be taking place on Newmarket racecourse and will pull everyone together to make some noise! You can be a part of it too! This entry was posted in Performances, Really Big Sing. The Really Big Sing will be taking place on Newmarket racecourse and will pull everyone together to make some noise! Come along on Tuesday 5th March and see what all the buzz is about. We’re meeting at Palace House, Palace Street, Newmarket, CB8 8EP at 7pm … be part of something really big. This entry was posted in Performances, Really Big Sing and tagged Newmarket Racecourse, Really Big Sing. Newmarket Community Choir is holding its first Christmas concert in aid of Newmarket Open Door. It will be held at The Stable in High Street on Tuesday, December 4, at 7.30pm. Tickets are available from Open Door in Craven Way. This entry was posted in Performances and tagged Carols, Christmas Concert, Performances.